For you guys commenting…I did not realize that I had to okay it before it was published, so sorry about that and thanks for participating! I love it. I’m just redeeming myself today with a quickie shot of my lovely desk all primed for productivity. There is a story about that desk..
A good friend of mine let me know that someones parents were moving into a care home and the children were selling some of their belongings, one of which was this desk. I went out to take a look. The address turned out to be a little mobile home. There were boxes of belongings and worn furniture so stacked you could barely get around. It struck me how sad it must be to have to pack your life up like that. I don’t know…maybe they were quite satisfied with the arrangement. I do tend to fantasize… anyway. 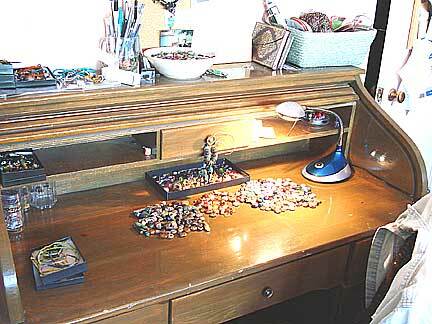 I liked the desk..I liked that it was a rolltop and all my work could be covered without putting anything away. Very cool feature. I got it home and was cleaning it out. There in the back of one of the drawers was the tiniest slip of paper and of course I was curious..I pulled it with my nail and it slid out. It was a hand drawn pattern for what looked to be either a quilt piece or maybe a little doll boot. But it was all I needed to seal the deal on that desk. I put it back and there it has remained with my own creative designs. I figured it was good karma.